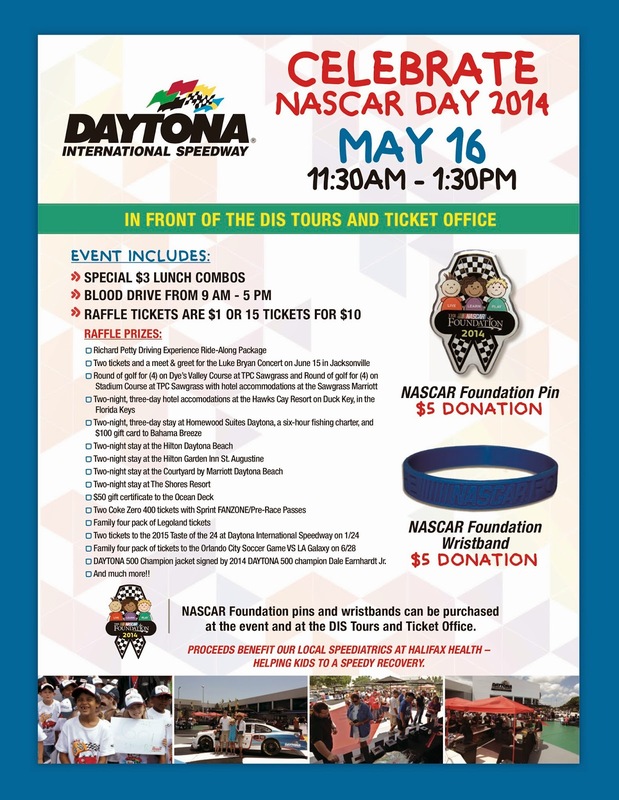 The NASCAR Foundation is holding another fun event at the Daytona International Speedway! NASCAR Day is an annual celebration of the NASCAR spirit and NASCAR fans. It has been held every year since 2004 on the third Friday in May. This date always is the same weekend as the annual NASCAR All-Star event weekend. NASCAR Fans are encouraged to purchase a collectible pin for $5 and wear it proudly on that day. NASCAR Day has raised over $1 million each year since 2005. The NASCAR Foundation was created to "harness the power of the NASCAR family and help a wide range of causes closest to our hearts." They support dozens of charities with NASCAR-themed fundraising events across the country. A few of the charities that the NASCAR Foundation supports include the Victory Junction Gang Camp, Speedway Children's Charities, The Ward Burton Wildlife Foundation and the Hendrick Marrow Program. Locally in Daytona Beach at the Daytona International Speedway, NASCAR Day is celebrated from 11:30-1p. THE Speedway will host its 11th annual NASCAR Day celebration in front of the Tours and Ticket Office with lunch specials, music, raffles and more! OneBlood will also be on site for a blood drive. For more information about NASCAR Day, how you can participate, how to order a pin and/or volunteer click here for the NASCAR Foundation website. Time is running out to nominate for the Betty Jane France Humanitarian Award, read about that here. On the DIS event calendar, you can see the flier below all big and pretty here.